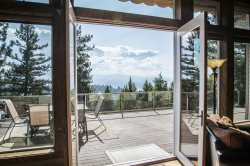 Enjoy a large deck, private boat dock and gorgeous views throughout. Nestled among a myriad of trees on the eastern shore of Coopers Bay on Hayden Lake, Water’s Edge is a charming waterfront escape with a unique outdoor area. Offering privacy and proximity, this home is located only 10 minutes from downtown Hayden and 20 minutes from downtown Coeur d’Alene. As you walk down several steps leading towards the front entryway, take notice of the large ponderosa pine tree and the well crafted stairway built around this picturesque tree. With colorful art and an unobstructed view of the sparkling lake through the large bay windows, this home has a playful and welcoming ambiance you’ll love. The bright and cheery living room has a beautiful rock fireplace, two large couches, a sound system and a table for four nestled in the corner. Whether you’re relaxing on the couch or seated around the table, you can enjoy the view outside or step out onto the deck through the sliding glass door. The lake is so close to this home you’ll feel like you’re right on the water even while still indoors! A pass thru serving window creates an open feel between the living room and fully stocked kitchen. This spacious area has ample counter space and great views to enjoy while you cook. Adjacent to the kitchen, the dining area has a large wooden table with seating for 4. With a private sliding glass door, you can step outside for fresh air anytime you want from the home’s master bedroom. This fantastic room has a queen bed and an attached bathroom with a soaking tub and shower. Both featuring gorgeous wood-lined walls, the second bedroom has a full bed and the third has three single over single bunk beds. You’ll also enjoy a great collection of books in both rooms! The second full bathroom is equipped with a shower/tub and a full-sized washer and dryer—perfect for washing those beach towels. We have a feeling you’ll want to spend every moment possible enjoying the incredible outdoor area! Stocked with everything you need for an ideal day at the lake, the outdoor deck features plenty of seating, a picnic table, benches and a charcoal gas grill. Spanning from the deck to the water is a large green lawn—perfect for the kids to play while still being within easy eyeshot. There’s also a great covered patio closer to the water with seating and a fire pit you’ll love gathering around in the evenings. The last, but certainly not least, feature of this home is the private dock with one boat slip. Whether you’re setting sail or jumping into the water, the dock is sure to get a lot of use! Gather the family together for a memorable vacation right at the water’s edge. The maintenance guy was awesome. He came right out to the house to troubleshoot the wifi and then contacted us with a solution soon after.